Recently I have become interested in notable Genevans, people who stood/stand out in the crowd for their actions, their work, their talent or their intellect. It isn’t an easy choice when you are trying to pick between entrepreneurs, developers, scientists, artists, educators, philanthropists and business leaders. There are a lot of folks who have their favorite Geneva person, like Elizabeth Blackwell, Red Dwyer, Arthur Dove, Jedidiah Chapman, Art Kenny, Bishop Hobart, Elizabeth Smith Miller or Cleo Cameron. However, with the exception of Elizabeth Blackwell, Cleo Cameron, Anne Fitzhugh Miller and Elizabeth Smith Miller most people are hard pressed to name any of our notable women. Who are some of the women who made their presence known in Geneva and beyond its borders? There are many more than you may be aware of, let’s meet some of them. Elizabeth Stryker Ricord (1788-1865) provided education for young women in a boarding school called the Geneva Female Seminary located in row houses number 387, 391 and 395. She taught subjects like mathematics, science, and foreign languages to young women who would otherwise be learning needlepoint, sketching and music. Her book, Elements of the Philosophy of the mind, was said to be the first textbook of psychology written by a woman for women students. 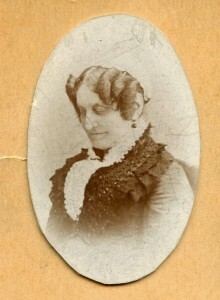 Sarah Hopkins Bradford was a leader in charitable work and village improvement. She wrote a history of the Village of Geneva that was published in the 1862-1863 Ontario County Business Directory, and biographies on Christopher Columbus and Peter the Great, but one of her most important works was Harriet Tubman, the Moses of Her People first published in 1869. Rhoda Palmer, (1816-1919) who lived to be more than one hundred years old, was the only woman to sign the Declaration of Sentiments at the first suffrage convention held in Seneca Falls in 1848, and live to cast her vote when New York State gave women the right to vote in 1917. An ardent supporter of women’s rights she was friends with Elizabeth Smith Miller and her daughter Anne Fitzhugh Miller. Rhoda died in 1919 at the age of 103. Carrie Collins,(18? ?-1926), was the owner and builder of Belhurst Castle and builder of Collins Music Hall at 459 S. Main St. She was an independent woman and surprisingly anti-suffrage! There are so many women who have contributed to the past, present and future of our City it is hard to include them here, but I will end with few more names that we should know. Helen Maney, an educator, was the first woman elected Mayor in the City of Geneva and she served as Mayor from 1974 to 1979. Joanne Wisor was the second woman to serve as Mayor of Geneva. She was in office from 1996 to 1999. Marion S. Whelan served as the director of the School of Practical Nursing. She was also a member of the DAR, and Zonta Club. Today the nursing program at Geneva General Hospital is named for her. Lucille Mallard, Lillian Collins, and Agnes Slosson Lewis are/were all strong, independent women who are a part of Geneva History. We should always remember them.